The Heath Agricultural Commission is conducting a survey for the Towns of Heath, Charlemont and Colrain and ask that you complete this survey now either electronically (see below for link), or PAPER copies will be available in the Heath Town Hall and Library. A post card will be sent out this week for more information – Thank you for your participation! Numerous farms and small-scale food businesses are located in Heath, Charlemont and Colrain, producing eggs, beef, cider, maple, poultry, hops and much more. The purpose of this survey is to 1) find out what items consumers would like to purchase locally, 2) determine what farmers and food businesses need to be able to produce and/or sell more products and 3) to find out if nearby restaurants and other businesses are interested in purchasing more products locally. It is hoped the answers to this survey will help shape the priorities of the Heath Agricultural Commission, as well as strengthen the economic viability of agricultural and food production in Heath, Charlemont and Colrain, and improve access to and demand for more local food in the tri-town area. 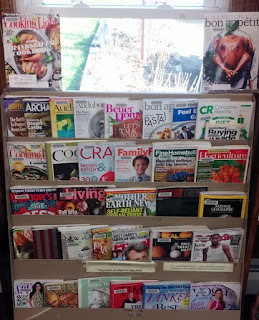 The covers of the November cooking magazines are touting their delicious Thanksgiving dinner recipes. Come in, check one out, and add a new dish to your holiday repertoire this year. Cooking not your thing? We have over 32 magazine titles to choose from, with topics ranging from American Archaeology to Yoga.